Create photo-worthy cocktail presentations with a set of Skewdats Reusable Cocktail Garnish Skewers. Take your Bloody Marys, tiki cocktails, and boozy milkshakes to new, memorable heights with a set of Skewdats Reusable Cocktail Garnish Skewers. Each Skewdat comes with eight durable and reusable plastic skewers that you pre-load with your favorite drink garnishes. Depending on your cocktail, that can mean anything from chicken wings and beef sliders to fresh fruit and cupcakes. You're only limited by your imagination! Once loaded, simply insert the skewers into the support hub and lock them in place. Then, set the hub inside any tall, beverage-filled drinkware for an over-the-top cocktail presentation. Impress your guests (and your social media followers) with a cocktail worthy of Instagram. Get your Skewdat 2-Pack today! Easy to put together and take apart. Easy cleaning. Perfect Bloody Marys. Great price. I'm hoping these help with making an awesome bloody mary contest winner! The skewers are very unique!!! I like to add a lot of garnish to my drink. 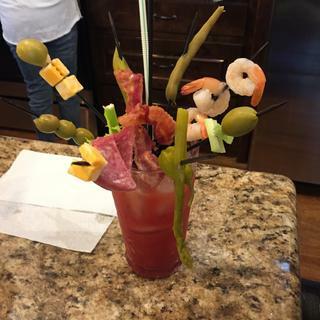 I have been searching for something to use for my mom's famous bloody Marys because not only are her drinks amazing but the "meal" you get along with it is equally amazing! The only hard part as finding something for all of garnishes until now! This looks like the perfect tool & I can't wait to try them.